The upcoming LG E960 Nexus 4 has shaped up to be one of the worst kept secrets in the industry. After being fully reviewed and lost in a bar, it was time for the handset's user manual to make the rounds. The manual which has subsequently been removed from LG's website reveals yet again the Nexus 4's close relationship with the LG Optimus G. Built-in 8 and 16GB memory options are all but confirmed, as well as the presence of induction coil for wireless charging. 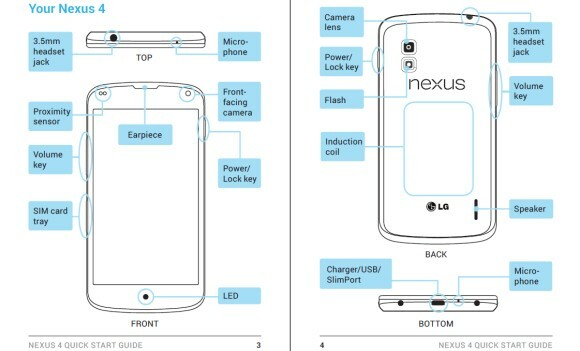 The LG Nexus 4 will be unveiled at a Google event in New York City on Monday alongside the also leaked, Samsung made Google Nexus 10. We will be live from the spot, so expect the full scoop on both devices on Monday.